What's the best position for staring at a glowing rectangle and frantically moving your fingers for eight hours straight? Sitting is killing us. Standing desks are better but have their own issues like foot pain and, apparently, cankles. Treadmill desks are costly and don't replace actual exercise. 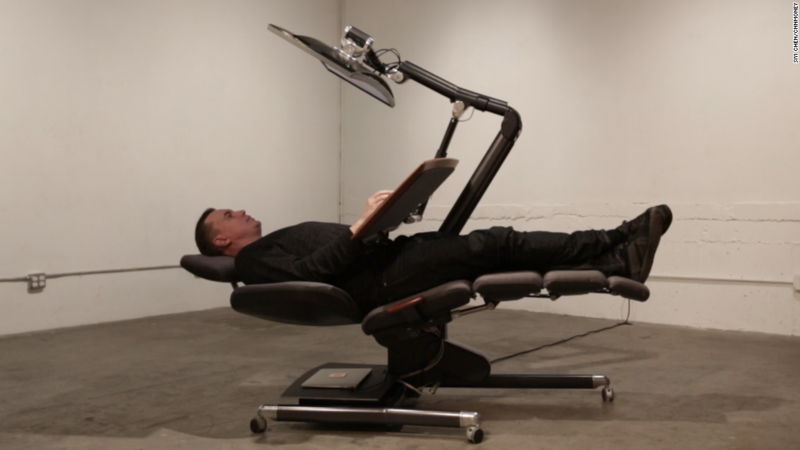 A new chair adds an unexpected option we all secretly dream about: working while lying down. The Altwork Station looks like a dental chair. It's an adjustable desk surface attached to one long, unbroken stretch of chair that bends into various positions. You can stand and type, sit and type, or lie down on your back and type. Monitors and laptops are securely affixed to metal arms so they don't drop on your face. The keyboard and mouse stick to the inverted desk surface with magnets. Altwork CEO and cofounder Che Voigt demonstrates his new reclining work station. At first, the chair looks like a frightening peak into the Wall-E future. But it's incredibly comfortable and takes very little effort to adjust. 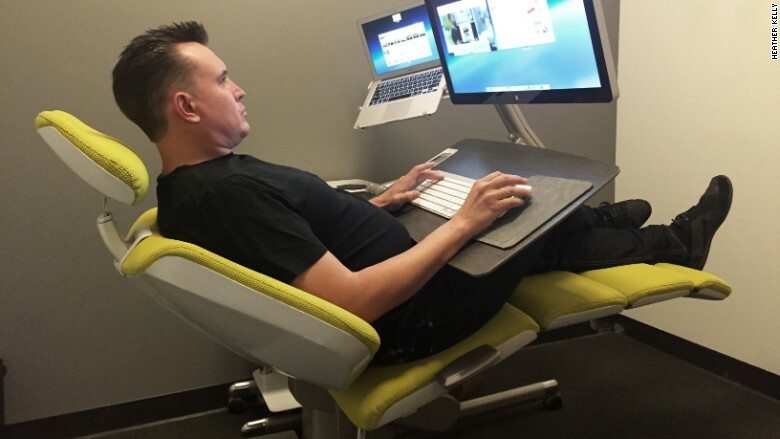 Just hold down the buttons on the desk and it slowly moves your body into various positions, like leaning slightly back with your feet propped up. But how much of a fix is this? Even more so than sitting, lying down seems to encourage a sedentary lifestyle. However, the idea isn't to spend all day in the laziest position possible. Altwork's cofounder and CEO Che Voigt hopes people will actually change their position a lot more frequently with the adjustable desk. The ideal use case is switching between standing, sitting, leaning back and lying down throughout the day. An automated desk makes the switch easy. For Voigt, the reclining position is for focusing. He claims it gets rid of the "fidget factor" and helps workers get into the zone. While there aren't studies on lying down while working, there are studies that support not sticking to any one position. Voigt hopes to see more research on the option in the future. Altwork sent a prototype of its chair to a team of ergonomists and tweaked it to be as ergonomic as possible. It supports the entire leg and includes rests for the back of the arms when reclined. When you change positions, the monitors and desk stay the exact same distance from the body. This is a serious piece of office equipment. It weighs 210 pounds without any computer or monitors and costs $5,900. The Sonoma, California-based startup has been working on the chair for five years. It will be available in mid-2016 but the company is taking discounted pre-orders ahead of time. One unofficial use for the chair might be the most appealing to the "high-intensity computer users" Altwork is targeting. Going completely vertical and taking a power nap. You know, for productivity's sake.